When building out local landing pages, SEOs typically take the same approach: keyword research around the big cities that show decent search volume, but not much else. Most neglect the small surrounding cities in the metro area. You should care about those smaller cities (Population of 5-10k+), because they’re likely filled with customers who are searching for your product/service—just not with enough volume for a single keyword to register search volume in tools like Google Keyword Planner. If you’re wondering why your local landing pages aren’t doing as well as you hoped, this is the post for you. One of our clients runs a service business operating in the BC Lower Mainland (the area encompassing Vancouver & suburbs). Their previous webmaster had already started a local lander build out, doing exactly what most SEOs do—finding keywords with service + city that show some volume in keyword tools and building out some ‘meh’ pages. Thankfully they had taken the time to write out some thin (a few paragraphs at most) but relevant, and unique content on each page. When approaching this project, we saw an opportunity to not only build out the existing pages, but also to create additional pages that covered other service areas that hadn’t yet seemed worth it. 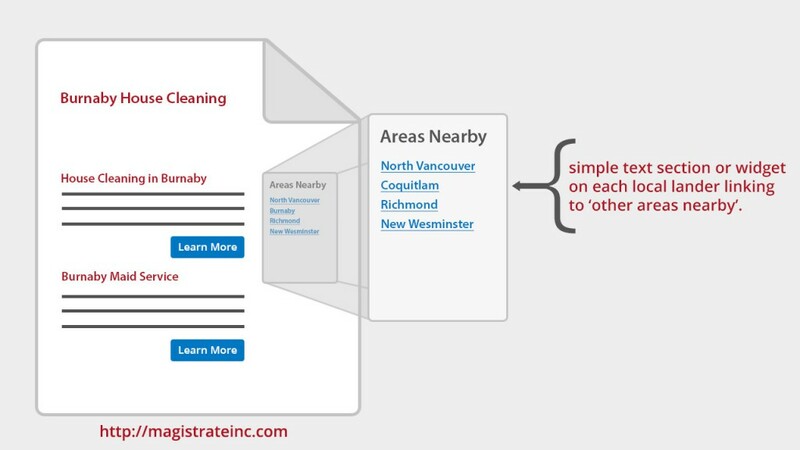 We spent approximately $60 per page to rewrite them, covering the majority of services they offer in each location, simply removing services not available in particular areas. The results since publishing the new content 6 months ago have been spectacular. 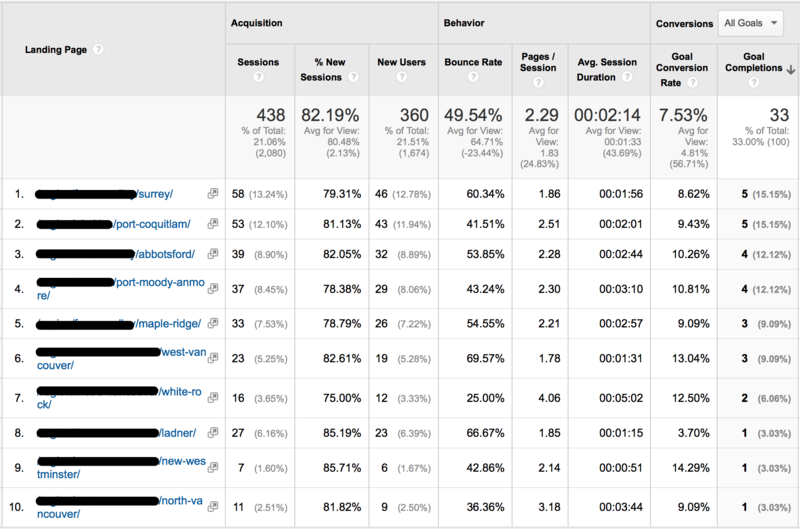 This is a snapshot of organic entrances to these landing pages within the last 30 days. 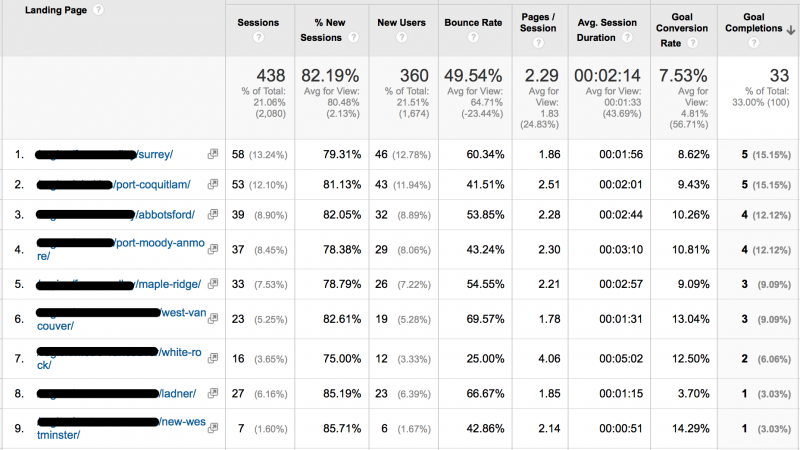 The goal-tracking covers only web conversions. We haven’t implemented call tracking at this point in time, but we can fairly assume that at least 50% additional conversions occurred via phone (their primary conversion source). The call numbers are based on manual call-tracking sheets filled out by our client’s phone sales reps. The new landing pages alone generated $15k in new revenue for this client just in April. It was a mixed bag of small and large jobs, but two major installations that accounted for almost half of the new revenue made the real difference in ROI. Needless to say, our client is happy. Overall we spent approximately $800 in content + time to build these out, and they’re generating a 5-15x ROI month-to-month, with zero additional promotion (at this time)—that’s right: no external linking, just internal. We first need a list of the areas we’ll be targeting. 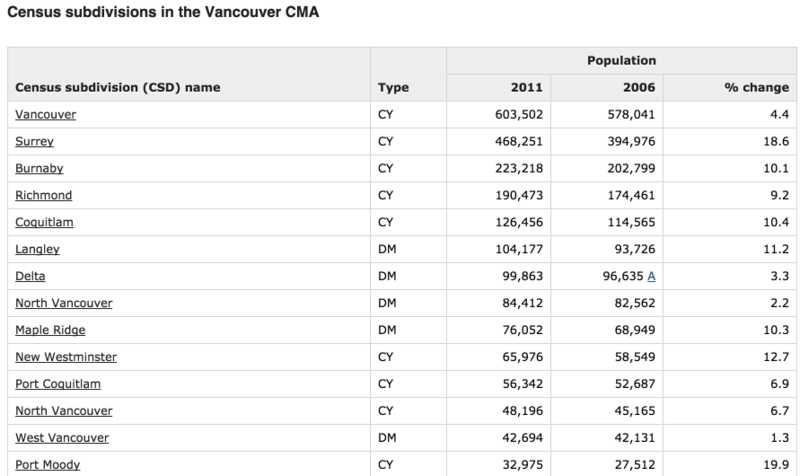 Most cities have population data available via a government census, and that data is typically listed on the city’s Wikipedia page. Most SEO experts would start with the most-populated cities and work down, but we’re looking for quick wins. Let’s start ¼ or ½ way down the list and work our way back up as our budget allows. For our client, we just did all of them from the start. Picking cities also depends a lot on where you or your client can/will service, some businesses don’t like to travel as far for a service/maintenance call, but will travel further for a new installation/new construction (big money jobs). We haven’t seen as much success in our neighbourhood-level build outs. The only niche we’ve seen this work well in is real estate, where there are opportunities in targeting the neighbourhood, school districts and even large schools. The costs of producing high-quality content for these very specific areas usually outweighs the returns compared to city-level pages. Many of these very small areas (neighborhoods, schools, etc.) can also be casually mentioned in the copy to hopefully draw in the odd long, long-tail search. Armed with our list of cities, we now need to do some keyword research. We’re not focusing on the volume, but more the use/occurrence of top level keywords and the structure used in that region. For local, we typically see <service> + <location> – ie. ‘House cleaner Vancouver’ – receiving more traffic than the reverse <location> + <service>, although we’ll be targeting & hopefully ranking for both. This may differ location to location, but that’s the popular order we normally see. We start with a build out of the core product/service keywords. We find these by looking at our client’s site, as well as the local competition and a few broad searches in keyword planner or keyword.io. 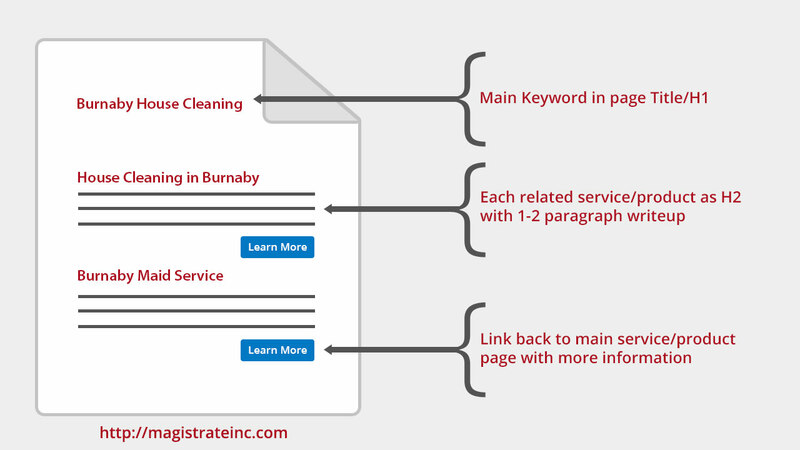 We’ll typically find 2-5 closely related keyword variations for each service – i.e. “maid service” “maids” “house cleaning” “house cleaner”. To ‘test’ these keywords, we’ll use city or state-level targeting in Keyword Planner and look at the local searches for a specific region without any geo-modifier in the keyword. This will give you a rough idea of the most popular terms to refer to your service in that region. We determine popularity based purely on volume. If we see ‘house cleaner’ receiving 2500 searches/mo. and ‘maid service’ receiving 1000 searches/mo. province or state-wide, we’ll shift our focus towards the more popular term. Google does a pretty good job of creating relationships between similar keywords. We’re only going with the higher searched terms to better highlight our service in the SERPs using the same words the user prefers in our page content, title and meta description. With topic-based on-page optimization, our writers will end up hitting on these terms in the copy. 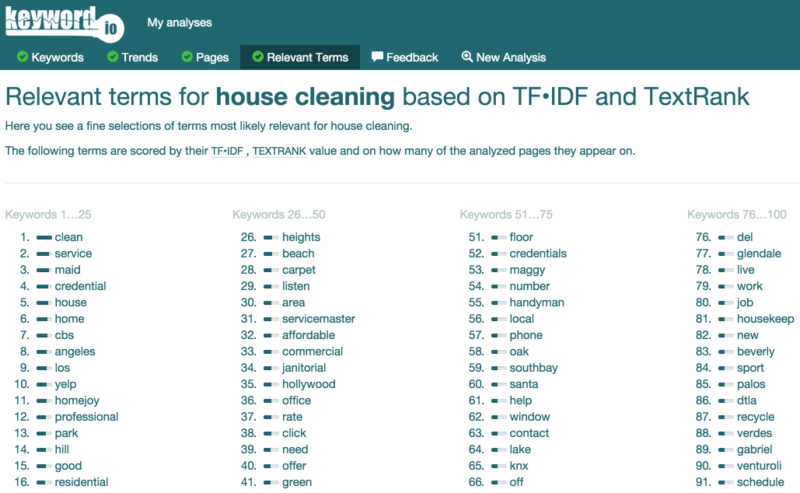 You can take this a step further by running the popular keywords we just discovered against the biggest cities, doing search volume estimates with keywords that include the big cities. i.e. “house cleaning Vancouver” “maid service Vancouver”. This isn’t totally necessary as you’ve likely already found the core terms and these searches will just confirm that. The most important part of our landing pages is obviously the content. We’ve laid the groundwork in developing the list of cities and keywords we want to target, and now need to write it up (or ship it off to our writers). The areas we are targeting are typically low volume and have minimal competition, so we just go for it – listing off every service offered. You can start with an opening paragraph about that region but we like to just jump into it. I’m not going to go into word counts or anything like that. As long as you accurately describe each service you’ll be good. Ours float between a few hundred and 1k+ words depending on how crazy our copywriters are feeling. Mix it up, don’t create 15+ pages that all have exactly 400 words on them. Do a small write-up on each product/service offered. This can be as long or short as you need to get the message across about what you or your client provide. We finish this off with a link back to the core service page. Each service is broken down with a H2 sub-heading. You can also take this moment to use some of those less-searched keywords we discovered and list them as a separate service, as long as they are unique enough to have a separate write up on. In this example ‘House Cleaning’ & ‘Apartment Cleaning’. I shouldn’t need to mention this — but make sure you spend some time (and/or money) on this content. Don’t write a single page and just swap out the cities multiple times. You may see some minor results (depending on competition), but it’s not worth waiting 1-2 months to see that your pages didn’t hit as hard as you wanted. On each page under each service ‘section’ should link back to the core service page. Think of this as a ‘more info’ link. The core pages usually have a better breakdown of the product/service (photos, color options, rough pricing, etc). They may also be better optimized for conversions than the lander we’re building. Our goal is to drive some link juice back to those core pages while also creating a great user experience for the visitor, allowing them to click over and get the ‘full picture’ for that particular service. The easiest way to link to these pages within a site is to incorporate them into your footer navigation. I wouldn’t recommend adding these to your main navigation as they’re likely less relevant to a user than your service landing pages. What we do to go beyond just a footer link is interlink the pages. When dealing with 15+ pages in a region, you have a lot of pages that need juice, and we manage that with a simple text section or widget on each local lander linking to ‘other areas nearby’. As an example for Vancouver: Cities directly surrounding would be North Vancouver, West Vancouver, Burnaby, Richmond and New Westminster. You may want to prioritize these based on the competition in each area—mentioning higher competition locations more often across the pages. This can also be done on the core service pages linking back to the local landers with an ‘Areas we offer <service>’ section. We try not to do this unless we can work it into the page without drawing too much attention. We’re going for pure search benefit here. These pages are typically much better than the local landers they’d link off to after all, whereas the reverse (local -> service lander) provides a direct benefit to users. With a small investment in writing out a few (dozen) unique pages and some smart internal linking you can push some decent local volume from these tiny cities each month. Even though this client does not have Google local listings in any of these locations, we’re seeing them in the top 3 for every core keyword in almost every location we targeted. Most of these SERPs do trigger local listings, but what we’ve seen with this client and others is that the local pack makes room for high quality, extremely relevant local content. Many of the similar providers with physical locations in small cities have big dreams and are going for the big city terms. Their pages only mention their physical location once or twice in the footer or contact page. Their onpage optimization isn’t aimed at their hometown because the volume wasn’t there when their SEO did the keyword research. Thanks to this thinking, it’s easy for us to swoop in and eat their lunch with a simple one-page lander built in a couple hours. 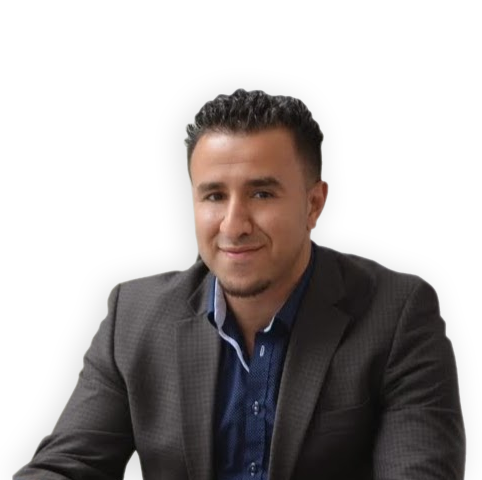 Michael is an internet marketer, specializing in SEO & PPC. He is the COO at The Magistrate & Partner at Loganix. Builder of things, and dabbler in many more, Michael runs a number of successful affiliate sites for kicks and giggles. This iframe contains the logic required to handle Ajax powered Gravity Forms. *100% Privacy. We will never spam you! Build top ranking, high converting local landing pages like the pros. Get your detailed guide now!